Microwave-assisted magnetic recording technology may be the next breakthrough HDD technology, promising lower cost and higher reliability than heat-assisted magnetic recording drives. recording. MAMR is an energy-assisted storage technology pioneered by Jimmy Zhu, a professor in the electrical and computer engineering department at Carnegie Mellon University. The new MAMR drive addresses many of the challenges that come with heat-assisted magnetic recording, another energy-assisted storage technology that has often been touted as the next generation of HDDs. HDD vendors are always looking for ways to increase the areal density of their drives -- that is, the number of bits that can be stored in a given area. One of the most important breakthroughs came in 2005, when drives based on perpendicular magnetic recording (PMR) technology became commercially available. In a PMR drive, the bits are aligned vertically, rather than horizontally, as in traditional disk storage. Aligning bits vertically substantially increases areal density. PMR drives have been widely implemented, yet they are quickly hitting their limit, maxing out at about 1.1 terabits per square inch. Technologies such as shingled magnetic recording and two-dimensional magnetic recording have increased areal density, but those disks are reaching their density thresholds. Part of the problem is that increased densities require storage media that support higher energy barriers to address thermal instability. However, to record data reliably against these beefed-up barriers, the actuator heads must generate stronger magnetic fields. That can be difficult to achieve with existing components. Energy-assisted technologies enable the heads to write to the denser disks. Storage vendors are working on developing two types of energy-assisted technologies: heat-assisted magnetic recording (HAMR) and MAMR. 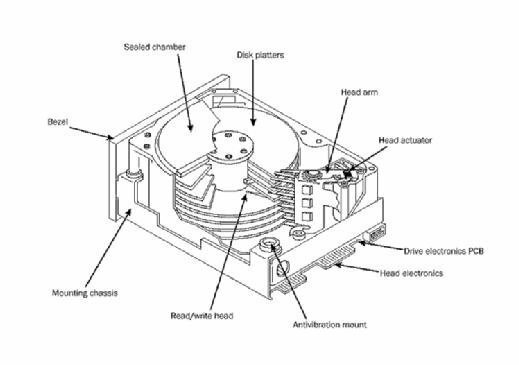 In a HAMR drive, special material is used for the storage media that's heated by a laser diode sitting directly in front of the write head assembly. After the data is written, the media cools and holds the bits in state. Over the past few years, Seagate, Western Digital and others have researched HAMR technologies, but progress has been slow. Among the challenges is the cost of implementing a laser in every head assembly. Even if costs can be brought down, heating the media still raises reliability concerns. HAMR also brings engineering and manufacturing issues. The drives need special storage media, and building them is a complex process that requires significant changes to the fabrication infrastructures. Seagate appears to have the lead in HAMR technology. It has customers testing HAMR drives now, and the vendor predicts volume shipments of HAMR drives in 2019. A MAMR drive requires no lasers or external heating, resulting in a more reliable drive. With a commercially viable HAMR drive still a ways off, Western Digital turned its focus to MAMR. A MAMR drive requires no lasers or external heating, resulting in a more reliable drive. A MAMR drive can achieve write operating temperatures comparable to traditional PMR drives. A MAMR drive can also be built using platters similar to those in PMR drives. Changes in manufacturing are only needed to the actuator heads. A manufacturer can use existing fabrication systems to build MAMR drives, lowering production costs and speeding time to market. Integral to the MAMR actuator head is a spin torque oscillator (STO), which generates an electromagnetic field near the head's write pole. This lets the head write data to the media at a lower magnetic field, enabling manufacturers to build drives at greater densities without sacrificing reliability. Western Digital uses damascene processing to manufacture the actuator heads. That process lets the company shape the heads with the precision necessary to incorporate the STO into the head assembly. Damascene processing makes it possible to mass-produce the drives and still meet performance and reliability standards. Western Digital also uses microactuation technologies to produce its MAMR drives. Microactuators can more accurately position the magnetic heads for writing data to and reading data from ultra-high densities. Compared to traditional actuator arms, microactuators move the articulation point closer to the head, enabling finer positioning and control. By combining the MAMR technology with damascene processing and the microactuators, Western Digital said it can deliver drives that are a hundred times more reliable than today's HAMR drives. The MAMR technology can also be used in conjunction with other technologies. For example, Western Digital's MAMR drive used helium-filled HDD technology to enclose the discs in helium rather than air to reduce resistance on the heads. Using the same media materials and manufacturing processes as PMR, Western Digital plans to ship its first MAMR drives by 2019. In addition, it expects to eventually produce drives with density rates greater than 4 terabits per square inch, with a goal of delivering 40 TB drives by 2025. What that means for the fate of HAMR is hard to say. Seagate is moving ahead with HAMR, and even Western Digital plans to continue its HAMR research. Until MAMR or HAMR drives are commercially available, it's anyone's guess which technology will emerge as the next-generation HDD. Either way, MAMR drives are well-positioned to shake up the industry, and we'll likely hear much more about them. Which do you think has more potential to be the next big HDD innovation: HAMR or MAMR technology?